Quite simply, touring motorcycles are built for touring. They display a number of the characteristics similar to those that can be found on a Sports Tourer, but on a much larger scale. Exhibiting a vast number of gadgets and convenience amenities, there is much less emphasis on speed and a lot more emphasis on the ability to casually cruise in exceptional comfort. Boasting large luxurious seats with enough room for you and your pillion to sink into, tourers are the perfect way to cruise through the windy mountain roads in style without sacrificing any comfort. Whilst any bike can be used for touring, there are a number of key characteristics that make these sorts of bikes more suitable for the job. The most common features of a tourer include large displacement fairings and high windshields which offer the rider a higher level of protection from the elements. Large capacity fuel tanks ensure long distance ranges between fuel stops, meaning longer, uninterrupted touring. Engines often have a low-end horsepower with a relaxed, very upright seating position. Large panniers and a top box are often included to ensure plenty of storage for the rider and any pillions. 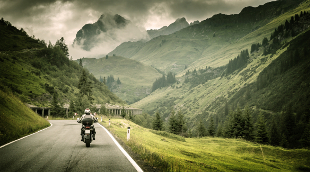 In addition, there are a number of optional extras available for tourers that you wouldn't find on other types of motorcycles such as stereos with radio, CD players and MP3 connections, heated seats, heated handgrips, GPS navigation systems and airbags, which all add that element of luxury. To get a quote for your tourer, click on our Get a Quote button at the top of the page. Alternatively, if you would prefer to speak to someone directly, feel free to contact us and one of our insurance advisors would be happy to help you find the right insurance for you. Considering a tour of the UK? Or even thinking of taking a tour abroad? Then why not take a look at our UK Breakdown Cover or European Breakdown Cover to give you added peace of mind.